Grown for its fragrance and beauty, this attractive aromatic plant also possesses wonderful culinary attributes. The sweet, fragrant, woody and floral aroma has a camphor-like, piney flavor similar to rosemary but with a slight bitter aftertaste. 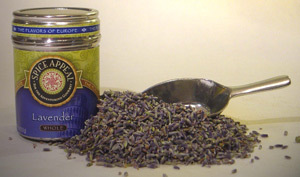 Dried lavender flowers have been considered a culinary herb since the 17th Century. Found in the French blend Herbes de Provence, as well as in Moroccan and Middle Eastern cooking. Use this wonderfully perfumed spice in a marinade for lamb, in fruit salads, jellies, and teas. Mix with sugar for a fragrant icing for cakes and cookies. Goes well with sweet dishes that contain cream.